I am still researching The Wenger knives and today I will show one in particular that sometimes are forgotten because it does not have any backside tools. There are also no toothpick or tweezers on the Basic 65. In other words this is a Basic 85mm Wenger knife. Mainly it is called The Apprentice when it got the inlay emblem, toothpick and tweezers, then it is the Classic 65 model Apprentice. The knife I will show and discuss today is the Basic 65 edition. Most already know that with Wenger knives there are so many variations and models and that knives for advertising may sometimes have toothpick, tweezers and inlay emblem or pad print emblem. The Budget line may also be different from the Basic line from time to time. Many times Wenger put the budget and basic line together in the history. Then again the Basic line may enter with a special series that could be different from the budget knives. 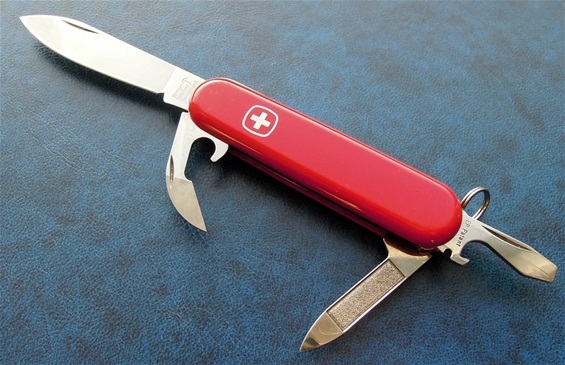 In my experience I have never had any problem with Economy Victorinox knives or the Budget Wenger knives and this includes the Basic series too. The Apprentice name is used by collectors and users even if it got no toothpick, tweezers and inlay emblem. On one picture I have shown some different Wenger knives that all include the pad print emblem. The Apprentice is only 49-50 grams and that is lightweight and still you have the knife blade, nail-file with cleaner tip, can opener, flat screwdriver with cap opener + the cable tool. It got a key ring. The flat screwdriver got the push lock mechanism. From researching many Wenger knives I am always open for impulses and details. From the late 1980s you can see the 3 knife Wenger blade stamp on the backside tang. This you can find on Basic, Classic, advertising and on other categories of knives made by them. The Basic is a knife made in simplicity but that does not mean it is low quality. Not at all it is Basic in appearance or in other words minimalistic in design and production. Usually it is always with red handle scales. 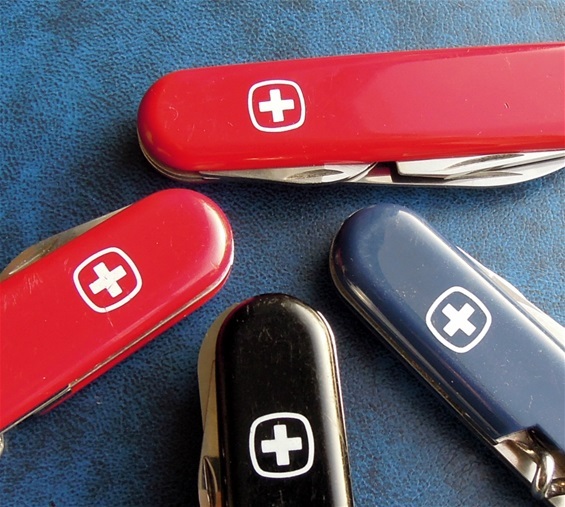 Advertising knives can be a mixed of all the categories and with several colors. 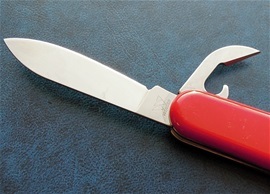 The main line by Wenger was the Classic 85mm knives for a very long time in their history. Wenger also made many handle scale color variation in the history that you can find used on all the categories made by this Company. In the Wenger history of the main line you can see the key ring with chain used on the Classic category. On the advertising knives you can see this chain as well. The budget or basic knives usually always just use the key ring.